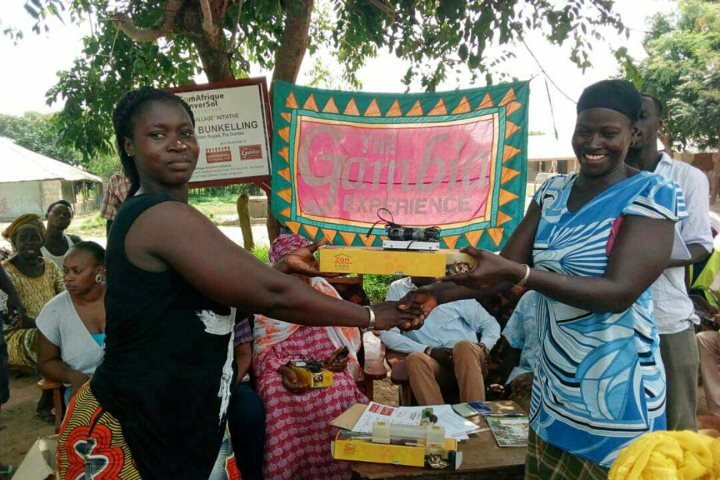 Thanks to the Rotary Club of Boston St. Botolph, another village benefits from solar powered lights. 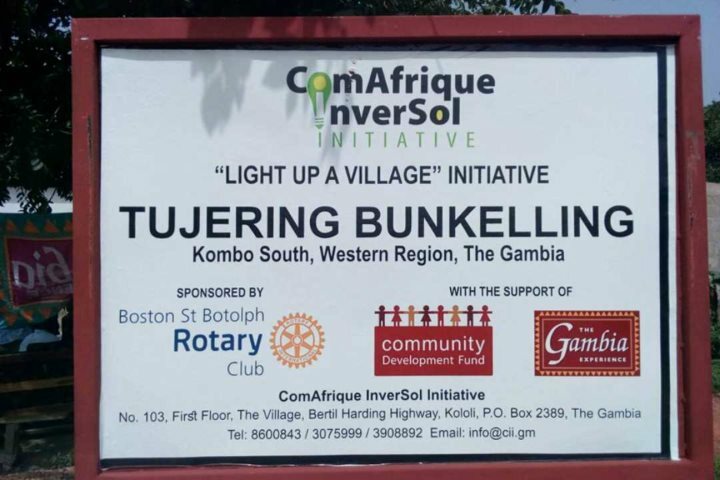 On 19th October 2017, the villagers of Tujeren Bunkling in Western Region, The Gambia, celebrated the donation of 20 LED solar power lights, thanks to the generosity and hard work of Boston St. Botolph’s Rotary Club, who donated £1,000 to our Community Development Fund. This is by no means the first time the club has donated to this fund - Tujeren Bunking will be their third village that they have brought solar power to. Prior to this, the club also supported a number of school projects in The Gambia, through our School Development Fund, and we are delighted to have their ongoing support. Rotary is a global service organisation with some 1.2 million members, and it has a great many clubs around the world. Boston St Botolph, for example, is a small club with just 16 members who meet up every Wednesday evening. Across all the clubs, members work to raise funds for local, national and international causes. “We decide at the beginning of the Rotary year which causes we are going to support both financially, and in person.” Maggie explained. Above: Rotarians Roy Vesty and John Wright loading the car boot with Rotary Club shoeboxes which have been filled with small gifts by local children. Helping our local food bank by raising funds for essential toiletries to be added to food parcels. Distributing and collecting Rotary Club shoeboxes to local schools and churches etc. The boxes are filled with small items suitable for either a boy, girl, baby, teenager, or elderly person. They’re taken to a national depot and then driven in a fleet of lorries to east European countries for distribution as Christmas presents. Raising funds to support a children's home in South Africa. And, of course, Lighting Up a Village. For these projects we successfully applied to the Rotary Foundation (one of the world's biggest charities) for grants to match the funds we had raised. Maggie continued: “We raise funds in many different ways, many of which involve eating and drinking! Some are just for members and partners, such as a wonderful Indian meal cooked for us by one of our Rotarians. Others are aimed at raising money from the public, such as a champagne afternoon tea which we held in a marquee in a member’s garden. 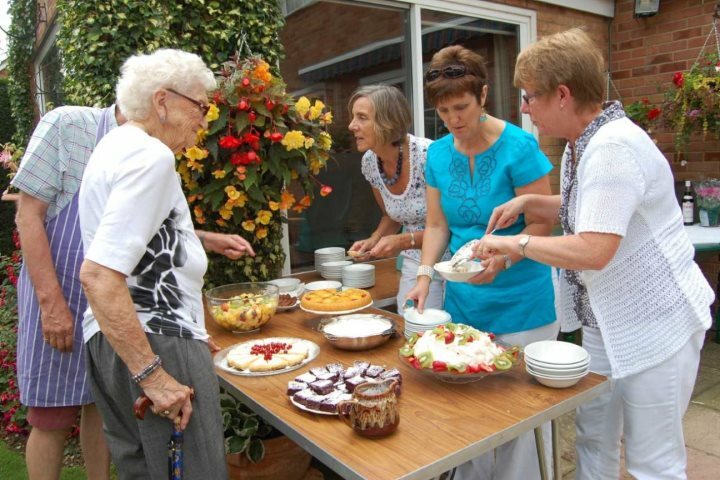 Above: Rotarians Maggie Peberdy, Lesley Hammond and Carol Brown serving desserts at a fund-raising barbecue. Above: Maggie Peberdy (then Club President) welcoming guests to the Bond Gala. 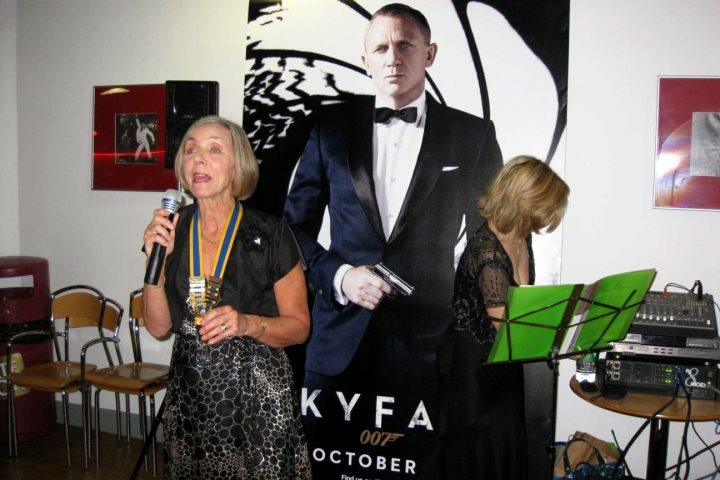 Above: Rotarian Jane Robson pictured by the (borrowed!) 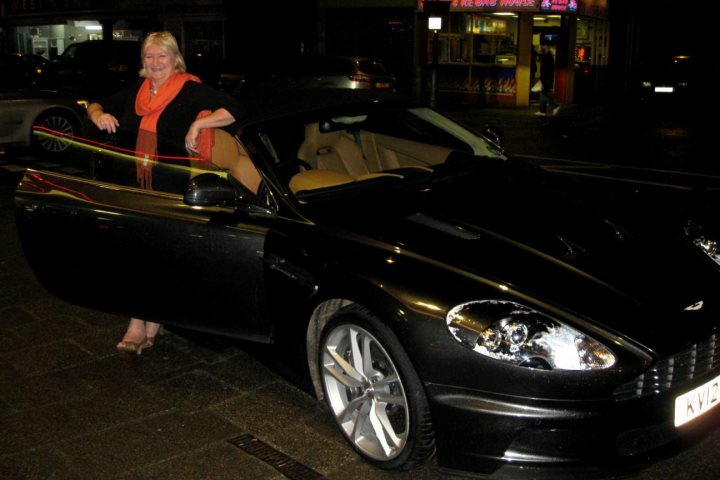 Aston Martin in front of the cinema at our Bond Gala Screening. "In the past, we’ve had open garden events and black-tie premiers of the Daniel Craig Bond films at our local cinema. We’re sure you’ll agree that the Rotary Club members are an inspiring bunch. 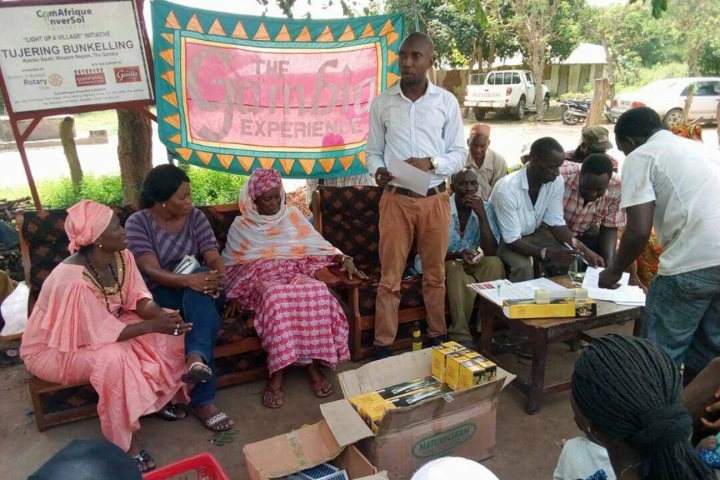 The villagers from each of the villages they have supported in The Gambia as well as all the staff at The Gambia Experience (both in The Gambia and here in the UK) would like to say a whole hearted thank you for their ongoing support. 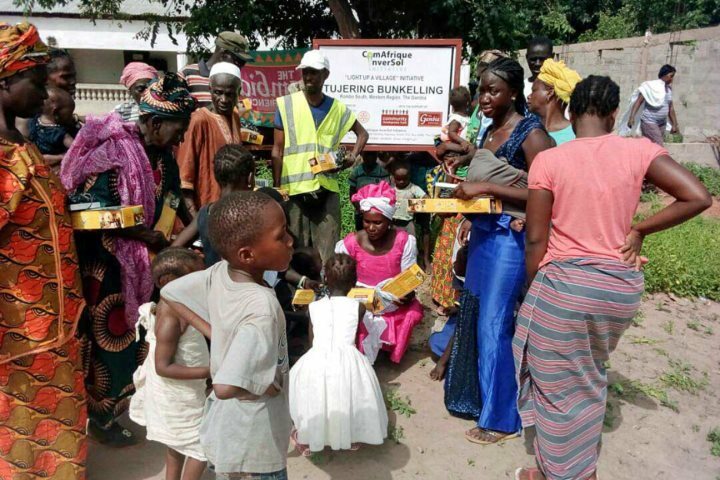 To find out more about our Community Development Fund, including the many benefits of solar powered lights, as well as how you can help, please visit our website, Community Development Fund.